Good morning, All !! Just a simple and quick post today. I love love love to make a wrist corsage. Last time, I ever tried to make it from ribbons. 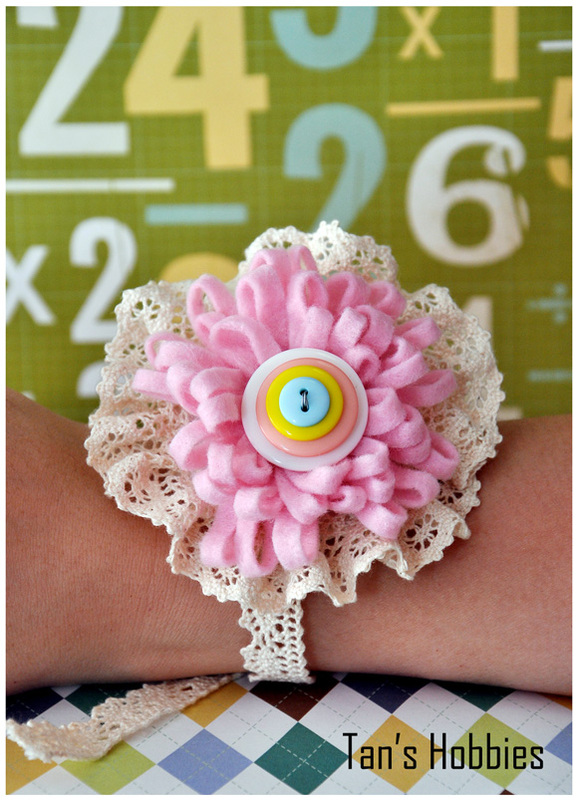 Today, I want to share my other wrist corsage from felt. Hope you all like it. Materials: Felt, Buttons, Needle, Thread and Lace!!! aww I love this...what an awesome idea...that would be so fun to learn how to do in a class..you should do a video...I would so watch it.. I love this Tan...so clever.. Very pretty! love the lace. Hello flower,this is ULTRA SUPER CUTE and I LOVE IT very much !!! Super LOVELY ------------ !!! Wow, I am wondering how you made with felt.... did you cut felt like long strip ??? I really LOVE your color combination, you know me, my favorite colors. (^.^;)""" And the lace made it more LOVELY and GORGEOUS !!! Just letting you know I have an award for you on my blog! Hope all is well! Very pretty creation! Wow am I ever impressed and so Easter morning ready. Wonderful!! Oh my this is beautiful! I so love it! Tan, this is absolutely FABULOUS!!! Oh, my goodness. I can't believe how beautiful, frilly, and girly this is. You have so many talents!! Do you wear these yourself, sell them, or give as gifts? WOW! I need to do some box corsage.Pls contact me to discuss ok. Thanks. Simon.